Last weekend I was in the fortunate position of having leftover dulce de leche and nothing to eat it with. 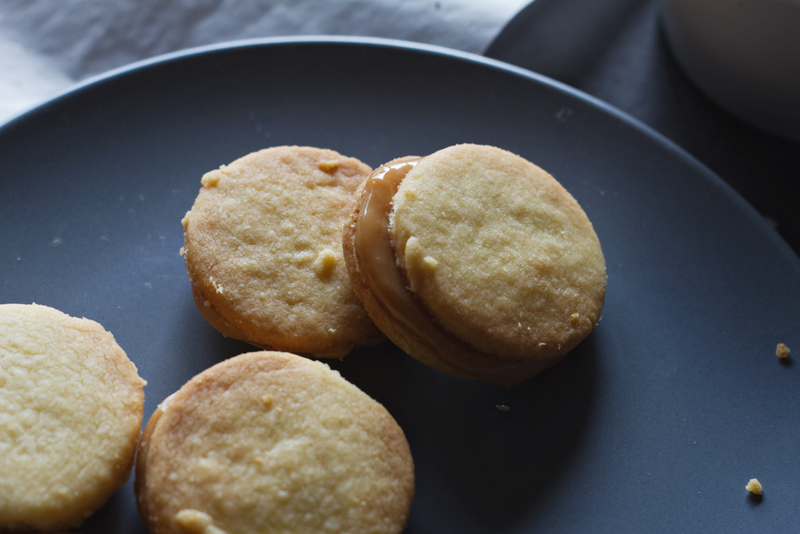 As much as I like just eating it by the spoonful (yes really), I decided that a better use would be to sandwich it between shortbread cookies. 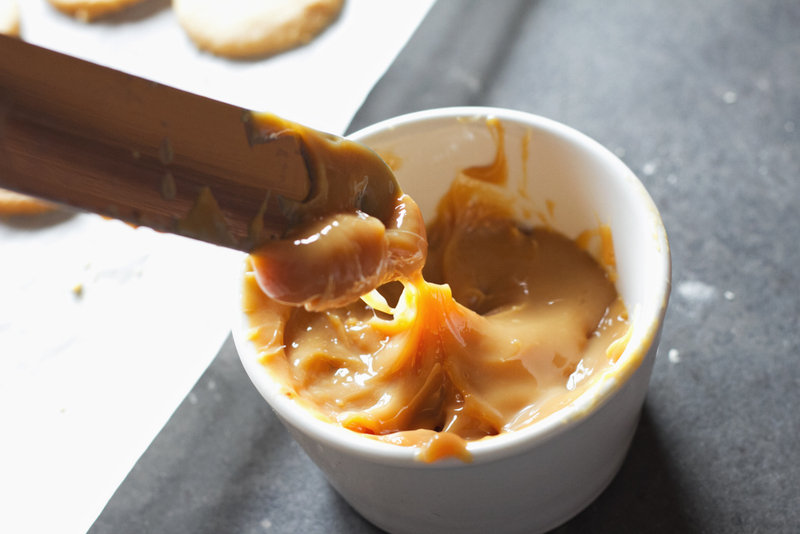 Dulce de leche translates literally to ‘candy of milk’, and is made by slowly heating condensed milk (or milk and sugar) until it turns into something like a gooey caramel. The Boy made ours using this Taste.com.au recipe for an earlier project. Not being someone who does things by halves, he was hoping to sandwich it between gigantic chocolate peanut butter chocolate chip cookies into massive double-sized super cookies that would probably give you a heart attack from looking at. I decided to go down a slightly different route. 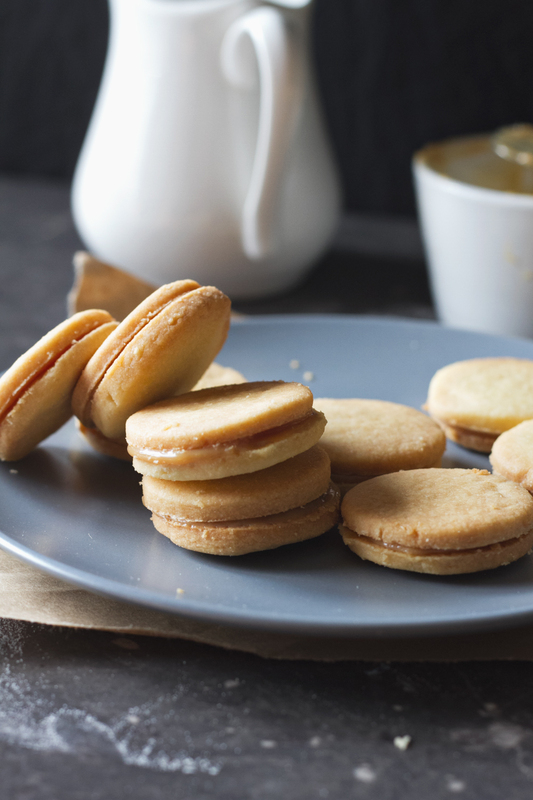 Shortbread is a favourite of mine, because what could be more simple than butter, sugar, flour and a pinch of salt? There’s something so pleasing about the crumbly texture and the smooth flavour of butter, the perfect vehicle for a filling. I deliberately rolled out the dough quite thinly, less than 5mm, and cut them into circles small enough to eat in one bite. Somehow I don’t have any simple round cookie cutters, only things like ninjas and stars, but a little wineglass does the trick. Shortbread dough gets trickier to work with the warmer it gets, so I find it easiest to roll and cut straight onto some baking paper and transferring the whole sheet onto the baking tray, saving the hassle of trying to pry thin and delicate circles off the bench and preserving the nice circle shape. They don’t expand as they bake, so I just crammed as many as possible onto one sheet. Fifteen minutes in the oven at 180 degrees and these guys were nice and brown and crisp. 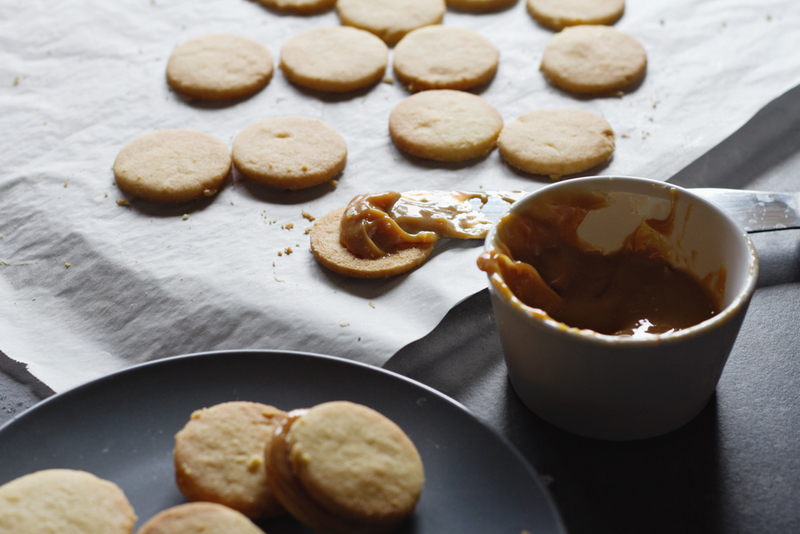 I had to be careful spreading on the dulce de leche, because these biscuits are so short (that is, full of butter) that they snap and crumble with a fraction too much pressure. 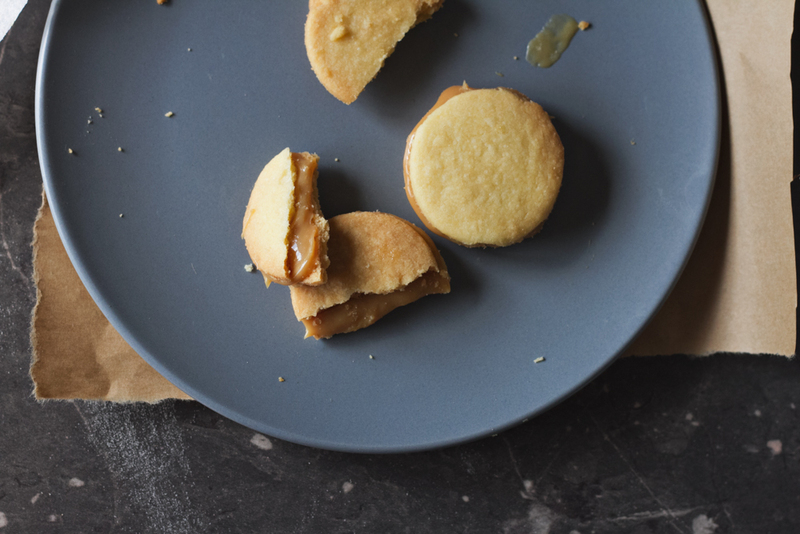 I found that smearing a circular dollop in the centre of the biscuit then twisting another one over the top, squishing the filling between them, gave the neatest results. The ones where I tried to put too much filling onto began to slide apart as the chilled dulce de leche melted slightly in the morning sun, delicious mistakes to be eaten before they made too much mess. 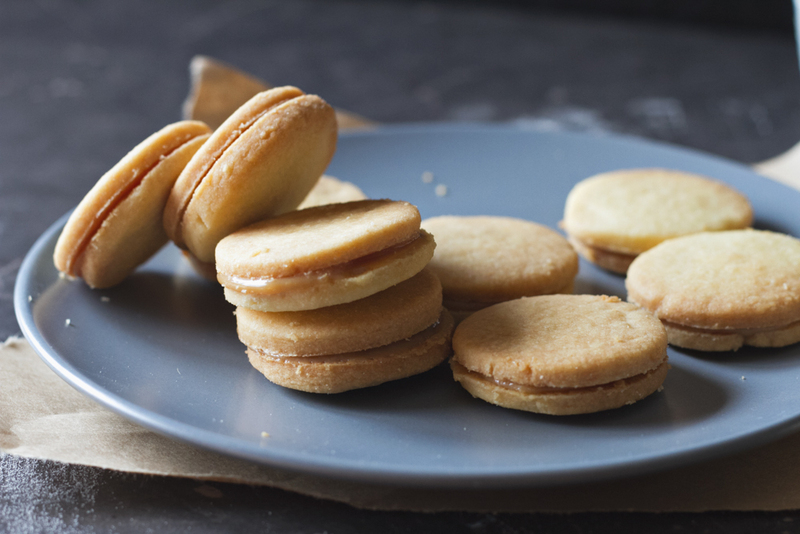 A small but decadent sweet treat with just a bit of salt. Perfect with a cup of tea, just remember they can be very more-ish. Adapted from my butter-stained copy of The Cooking Book. 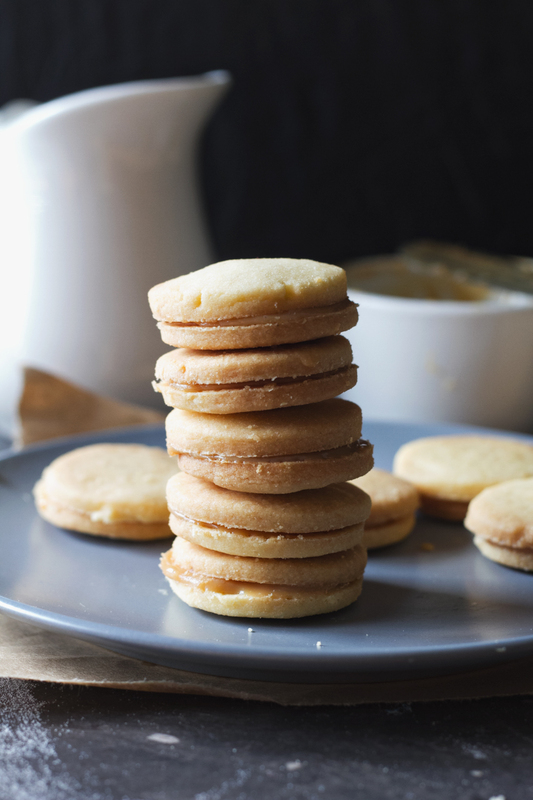 Make roughly 30 double-decker cookies. 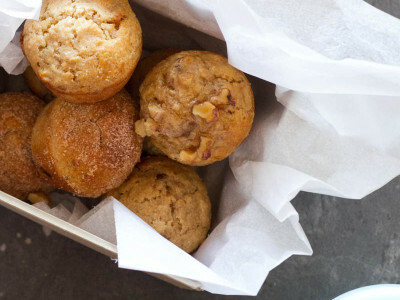 Beat the sugar and butter together until soft and fluffy. Add the flour and salt, then mix until combined and the mixture forms a dough (it can look like dry breadcrumbs at this point, but it always comes together). Knead gently until it becomes a smooth dough. Roll the dough onto a lightly floured sheet of baking paper, to a thickness of ~4mm. The butter content can make this dough difficult to roll without sticking – I find giving the dough some time in the fridge and rubbing some flour over the rolling pin before rolling can help. 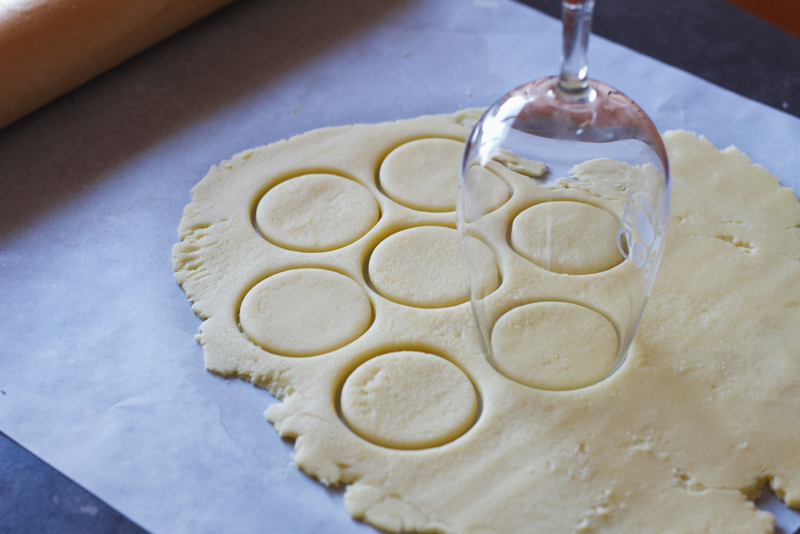 Use a ~4cm round cutter to cut circles in the rolled out dough, then remove the scraps and repeat the process. As the biscuits don’t rise as they bake, they can be cut very close to one another. Move the sheet with cut circles on top onto a baking tray, and bake for ~15 minutes or until golden brown. Once baked, transfer to a cooling tray to cool completely before adding the filling. 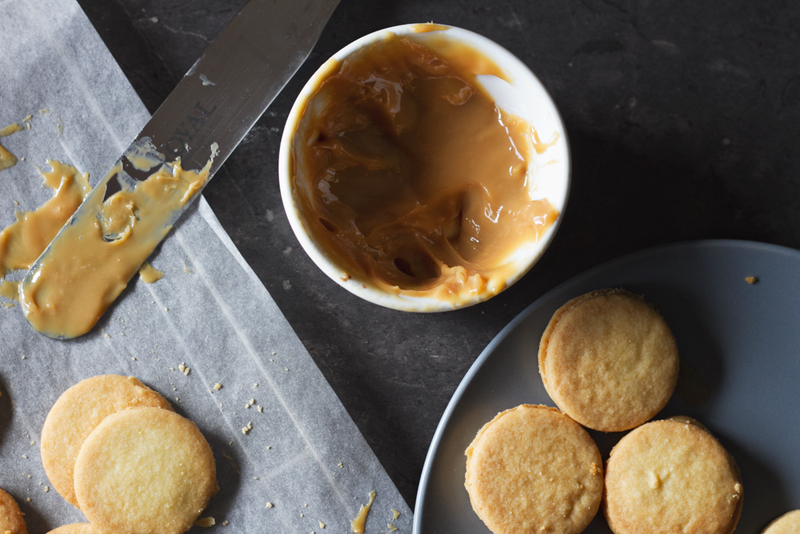 Carefully spread a dollop of dulce de leche onto the center of a biscuit with a circular motion, then push another on top, twisting as you go to evenly spread the filling. I’ve found these cookies stay crisp for a few days in an airtight container, whilst the dough can be rolled into a log and frozen for up to 3 months, ready to be sliced up and baked for emergency cookies (it happens). P.S. 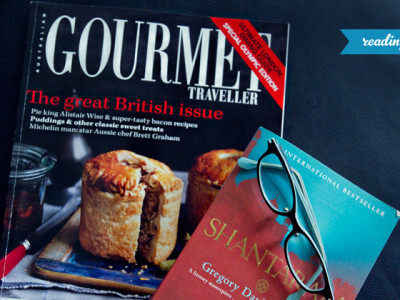 I’m digging rustic, ‘real’ food styling lately, especially as it meant I could take photos right in my kitchen work area and just tidy up all in one go at the end. I often over think styled food shots, but this one was mostly on the fly and a whole lot faster for it. What do you think? These look so good. I made some dulce de leche and have been looking for inspiration. I think I found it!